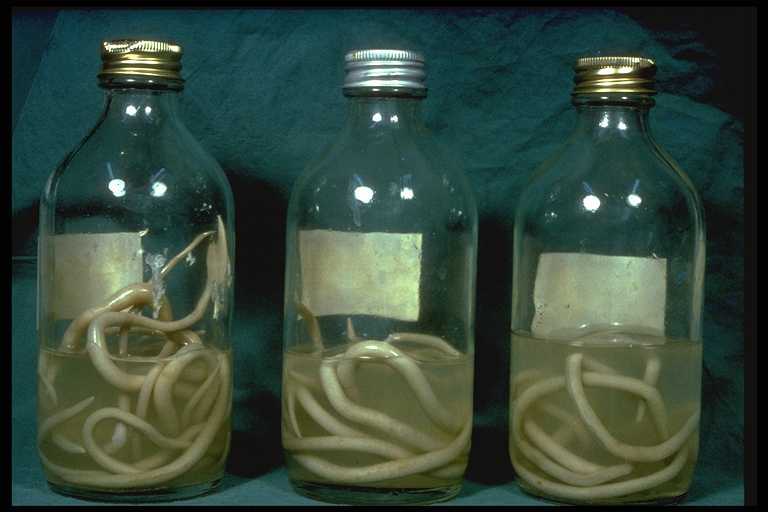 Ascariasis is the most common intestinal nematode infection. It is estimated that approximately 1 billion people are infected worldwide. Many infections are asymptomatic, but in a heavy infection, bowel obstruction may cause death of children. Infections occur after per oral uptake of embryonated eggs with faecally contaminated uncooked food or soil. Eggs are only infective when they contain a second-stage larva. Therefore no direct person-to-person transmission is possible. This development outside the host takes 2 to 3 weeks and the eggs remain infective for years under optimal conditions. After ingestion of embryonated eggs, larvae hatch in the duodenum and penetrate the mucosa. Via lymphatics and blood, after 2 weeks they reach the lung where they moult and invade alveoli. Larvae ascend the trachea and are swallowed. Adult worms are found in the jejunum approx. 2 months post-infection. Female worms (20 to 40 cm long) produce an average of 200,000 eggs per day!